Very good. 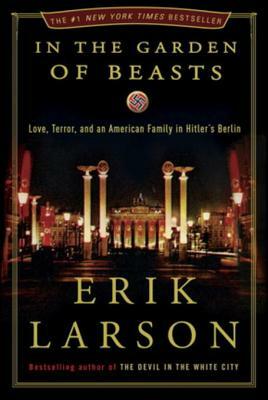 In the Garden of Beasts: Love, Terror, and an American Family in Hitler's Berlin by Larson, Erik. All pages and cover are intact. Spine and/or cover may show signs of wear. Some page corners are curling. Some peeling and/or curling is on the cover. ~ Goodwill Industries of Greater Grand Rapids, Inc. is a non-profit organization dedicated to changing lives and communities through the power of work. He gives this history a life with faces and flesh. Life in the pre-World War II, 1930s American embassy in Germany is revealed, The book gives a close-up view of William Dodd and his family as they arrive, settle in, and finally leave Germany. The family's struggle to understand what was happening around them as Hitler consolidated his power is compellingly written. Like other evil geniuses, Hitler was a master at deception and manipulation -- fooling the Dodd's was child's play. There are lessons to be learned from this insightful book. Excellent book. Led me to read all his other books. Learned a lot about US politics of the time. Every time I think there's nothing left to learn about the holocaust more relevant information shows up. Well written and absorbing. If only it were a work of fiction.